Almond Corner: Once again I could not resist! 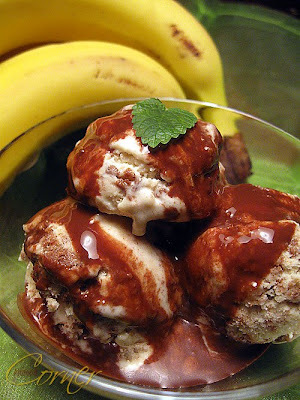 I must confess: I still haven't had enough of the chocolate-banana combination! Luckily I have a good excuse: poor bananas got really brown and I had to use them, no way out! I baked my favourite brownies, but only a quarter of the recipe, as I only had one lonely egg in the fridge. 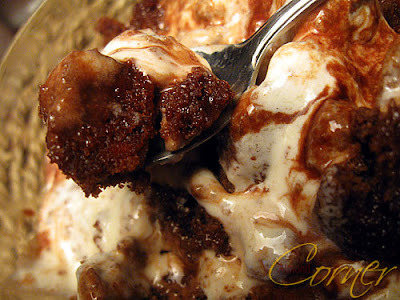 To make it as scrumptious as possible, I added the brownie chunks to the banana ice cream and served it with a warm chocolate sauce. Could you resist?! 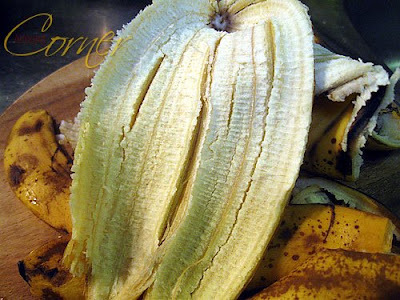 Peel bananas and puree with the lemon juice and sugar. Stir in condensed milk and beaten heavy cream. The rest of the work does the ice cream machine. For the chocolate sauce heat water with sugar and boil until sugar is dissolved. Stir in chopped chocolate and cook until it is thick enough to cover the back of a wooden spoon. Oh my god! It looks delicious. We could not find this in our country so your recipe is useful for me! I love your blog very much!! !